Part of the problem of creating regular blog content is the almost inevitable slow death. A couple of weeks ago I talked about how writing multiple posts at once will give you a much better chance at ensuring your blog doesn’t die. Today, let’s look at how you weave those multiple posts into a plan. There’s a big difference between writing a blog post and publishing it. You have to take what you’ve written in Word, or whatever word processor you use, and put it on your blog. You’ll also have to edit the post and, once you’re done, keep it separate from the posts you haven’t edited or posted yet. It’s a little complicated, but it’s easy to do. Here’s how. You’ll want to make several desktop files for each blog you write. I keep a file for each ghost-blogging client I have. In each file, I have sub-files for the posts. The “Posts” file has an “Edited” sub-file, and that file has a “Posted” sub-file. Step 1. Write several posts. Step 2. Keep the posts in your “Posts” file. Step 3. Edit one or more posts. Step 4. Move the posts into your “Edited” file. Step 5. Post the articles to your blog and schedule the publication date and time. Step 6. Move the posts to your “Posted” file. With your posts edited and ready to publish, it’s best to post all of them into your blogging platform at the same time. Just as you it did when you wrote them, posting them at the same time will save you time and let you get ahead of the work. Once posted, you’ll want to schedule publication. 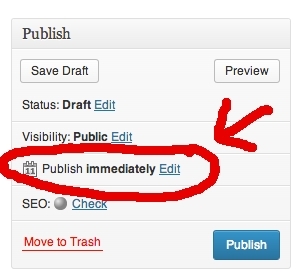 Most blogging platforms will let you do this fairly simply. This is where you click to schedule a publication time and date in Wordpess. Of course, you’ll also have to keep track of all that good work you’re doing, as well as be able to look ahead to see what you’ll be writing in the weeks and months to come. That’s what we’ll look at next week.